“Jerry Presley “Elvis Live!”" is the Branson tribute to The King that can’t be missed! 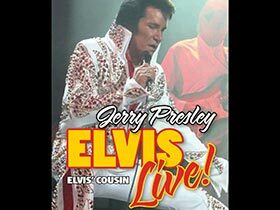 Cousin to the most famous singer to ever live, Jerry pays homage to Elvis as only family could ever do, and he stays true to all the details of an authentic Elvis concert, including an amazing live band. Jerry wears costumes replicating every last detail of those worn by Elvis; they’re even made by the same company. With that signature Presley charm, he keeps audiences dazzled with his impeccable performance of songs from Elvis’ unforgettable Madison Square Garden and Aloha from Hawaii concerts, as well as his beautiful gospel recordings. The show’s schedule varies; you can choose from the two different concert performance tributes, or a show that highlights the gospel music that Elvis loved so much. Jerry’s Elvis pedigree includes performing with the Jordanaires and former members of JD Sumner’s Stamps Quartet, groups that worked with Elvis for years. Jerry Presley has gained his own loyal fan base over the years, especially in Branson where his performances date back to 1985, and where he’s credited with performing Branson’s first tribute to Elvis. In addition to working with former Elvis band mates, “Jerry Presley” has enjoyed an amazing opening act career that included concerts by Mitch Ryder, Billy Dean, George Jones, Tanya Tucker, Tammy Wynette, The Coasters, and more. Whether you’re a diehard Elvis fan, or you’re just now becoming familiar with the unforgettable music of the King of Rock ‘n Roll, this is the Elvis Presley tribute for you! And don’t forget to hang around after the show; Jerry enjoys taking photos with fans and signing autographs. “Jerry Presley “Elvis Live!”” lets you experience the magic of Elvis in the place where tribute shows reign supreme...Branson, Missouri!